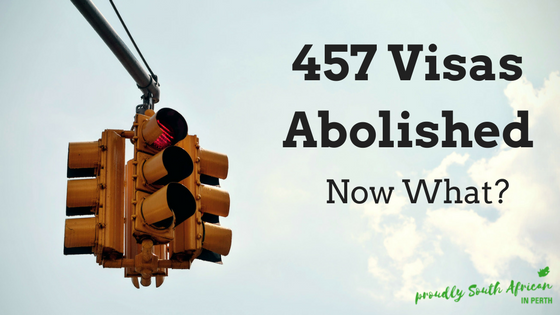 457 Visa Abolished – Now What? If you’re following my blog it’s likely that you’ve been watching the drama unfold with the recent abolishment of the 457 temporary visa for Australia. While at first it didn’t seem like much more than another political gesture, it soon emerged that there are going to be far reaching and, unfortunately for some, devastating consequences. While most changes to visa regulations are applied only to any new applications, the changes to the 457 visa in April 2017 mean that anyone on a 457 visa or in the process of applying for a 457 visa are also affected by these changes. The 457 visa has been abolished as of 18 April 2017 but there will be a temporary grace period until March 2018. It will then be replaced by two new temporary visas – one is a 2 year temporary skills shortage visa and the other is a 4 year temporary skills shortage visa. The 2 year visa can be granted if your occupation is on the Short Term Skilled Occupations List (STSOL). The 4 year visa can be granted if your occupation is on the Medium and Long Term Strategic Skilled Occupations List (MLTSSL). One of the biggest changes is that the 2 year temporary visa will NOT have a pathway to Permanent Residence (PR). At the end of the two years you will be required to reapply for a new temporary visa or return to your home country. The new 4 year temporary visa will have a pathway to PR, however, it will be more difficult to obtain with new conditions being introduced. Once on PR, you will also now need to hold PR for at least 4 years before you will be eligible for citizenship – this used to be 4 years onshore and at least 1 year on PR under the old 457 visa. Essentially this means that instead of having to have a minimum of 4 years onhore with at least 1 year on PR before being eligible for citizenship, you will now need 3 years on the new temporary visa plus another 4 years on PR. 7 years before being eligible for citizenship. That’s a long time. From March 2018 the 457 visa will be officially abolished and replaced with the Temporary Skills Shortage (TSS) visa. The government is also proposing that you will need at least 2 years relevant work experience before you can apply for a Temporary Skills Shortage (TSS) visa, as well as an English language requirement so you’ll have to complete an IELTS test (or equivalent) with different minimum requirements depending on which visa you’re applying for. You can read the full list of the changes on the Border website here. Who Do The Changes Apply To? The most disturbing thing about these changes is that they apply to not only new applicants, but also to those who have already applied for a 457 visa and those already living in Australia on a 457 visa. It is completely unfair that these new conditions will apply to them as they are clearly very different conditions than the ones they agreed to when they moved to Australia. There are thousands of people who are up in arms about these changes, so much so that there are multiple Facebook groups and petitions already circulating. One group of migration agents, including Joey Barnard from Call Australia Home, who help many South Africans migrate to Australia each year, has started a group called “Fair go for Australian migrants 2017”. They are calling out for your personal stories of how you will be affected by these changes and are hoping to legally challenge the government and appeal to them to reconsider applying these new conditions to existing 457 holders and applicants. If you are affected by the recent 457 visa changes, and would like to share your story, this will help them to build a better case to put to the Australian government. Join the group here and let them know how this is going to affect you and your family. “We left NZ at the end of 2011 as NZ Permanent Residents, as a result of being “headhunted” by an Australian company in desperate need of skilled and experienced workers. 457 Visa was promoted as a pathway to Australian residency, with fairly limited risk. My family came here on our 457 Visa and we started our new life. Unfortunately my sponsor did not keep the promises that was made to me. After three months, I joined another company and my 457 Visa was transferred. Life was good. Julia Gillard then changed the 457 Visa rule from employment of one year at your employer to two years at your employer, in order for 457 Visa to qualify for PR. As I was 48 years old, I was now in trouble as I had very limited time left, before turning 50. I missed my PR by one month, when my employer closed down. By the grace of God I managed to find employment immediately, but as I have turned 50, I have to work for my employer for (4) years and earn more than the high income threshold, in order to qualify for PR. I have met all the income requirements and will complete my (4) years in April 2018. Under the “old” rules, PR was within my reach, but now it is just a distant dream. Over (5) years in my adopted country and it seems that once again I will miss PR by one month, due to the second time government changed the rules during my 457 Visa period. “We came over in Aug 2013 on a 457 visa with 5 kids and like most started from scratch. We sold everything in South Africa so that we could pay for our visa costs, IELTS tests, medicals etc and came over with $300 in our pockets. My husband started working immediately and I had to stay home as we had a then 2 and 3 year old that we couldn’t afford to send to a daycare. After struggling financially, I had to go look for night work when he got home in the afternoon, just to get by. After 4 months, hubbies company closed their doors and we had to quickly find something else. We moved to a small town where he could get a job and moved what we had and our kids to new schools. The new company promised us that they would help with applying for PR in about 6 months, as soon as he worked for them for a while. Everything was fine until the 6 months went by and we started asking about the PR. They delayed and delayed and after working for them for 11 months they came back to say that the guy who employed him on those terms had left and they were looking into it and and and, one excuse after another. We found out that this was a old trick of them through some other employees to get people to work but they never helped them with PR. So again we started looking for something new. My husband has been working for one company in ZAR for 18 years and really started feeling like a failure as he was job hopping and this wasn’t something he was use to doing. We got a job offer from a guy in Brisbane who was Chinese and promised us he would help with everything as long as he came to work for him. Took a knock and moved with all the kids to Brisbane. Got here and was suppose to start right away only to be told he could only start a month later as he scheduled staff already over Christmas (should have seen red flags then already). We sat without an income for over a month. Again a lot of costs with visa changing etc and a move aswell as a break of lease. (Had to pay double rent for almost 2 months), Kids new schools and school uniforms etc. I had to go find a night cleaning job just to have food on the table while hubby was home with the kids. After working for this employer for a month and not getting payslips, no super being paid and no tax being paid and a huge language barrier, as he was Chinese, we started looking around again before we got send back to RSA for not paying taxes and Aus government maybe thinking we had fault in this. (Wanted to do everything to the book in a new country). So he found something with another employer that was wonderful and that he still works for today. (Been there for just over 2 years now). I had to still work nights just to help us and was still a stay home mom during the day cause we couldn’t afford daycare. His employer helped us to apply for PR but the process now cost us another IELTS test, medicals, police clearance from RSA and Aus and of course another $13500 for the visa. We bent over backwards to get this done with a family of 7 but we managed finally.1June 2016 our PR visa was granted. And I cried my eyes out as we had been through so much and finally we made it. We started counting down the time we had to wait till we could now finally become Australian Citizens. No more worries or paperwork. No more renewing RSA passports and by now my eldest finished school end 2016. We decided that she had to take a gap year until we got Citizenship so that we could apply for help with her studies. And so she did. I stared getting all our paperwork ready for our Citizenship application a month ago to see if there was anything extra we would need to get and put it into a file for us as Aug 2017, we could now finally, after 4 years, make our dream a reality. THEN overnight in April, this carrot that hung in front of our noses, got ripped away. We felt like everything we have been working towards and have been waiting for so patiently, had been taken away. I feel heart broken. Why, oh why? Haven’t we had enough to deal with already in the last few years? Why do people that came in a few years ago under certain rules, now have to have their dreams ripped from under their feet? “We have been on a 457 visa since Jan 2007. In those ten years we have been unable to secure PR due to redundancies & time frames but never given up hope & have always considered Australia our forever home. Due to my husband (the primary visa holder) recently joining a new company, if these new changes are implemented, by the time he has completed 3 years with this employer & eligible to apply for PR he will be 47 which due to the changes means we will no longer be eligible. Having committed the last ten years to this amazing country we call home we are devastated to be told there isn’t a future here for us. My 3 children know of no other way of life. My eldest, now 14, was just 4 when we left everything behind in the UK to make a new life in Australia. She hasn’t stepped foot out of Australia since. Now her hopes of studying at Uni have been squashed & unsure what the future holds for her. My 8 year old twins were born here & again have never stepped foot out of Australia. Although they’ll be eligible for citizenship on their 10th Birthday, it doesn’t really mean a lot when the whole family is forced to leave. We have paid taxes for 10 years, school fees, not claimed a cent, can’t even get the allowance for our children’s dental care. We have integrated with our beautiful community, made many friends we now call family & become dedicated members of our local SLSC. I’ve known many immigrants arrive on PR visas, haven’t felt the connection or the love we feel for Australia so they stayed for 4 years to get their citizenship & return to the UK, just so their children will have the choice of returning in many years to come if they wish. If you’d like to stay on top of the changes, make sure you join the Facebook group South Africans Migrating To Australia, which is run by reputable MARA registered agents who share up to date migration advice. Please note this blog does not constitute migration advice – I am only sharing relevant information regarding the recent visa changes announced. I Want To Migrate To Australia – Where Do I Start? This whole situation is very unfair – my son lives in Dubai, and is the ‘last’ of our family who would come to Aus, without 457 being available anymore, our hopes are shattered. We as a family have spent thousands to get here, we live as law abiding citizens, pay our taxes and are so thankful to be here. I get so angry and want to ‘stamp my feet’ when I see others coming in (some refugees, NOT all) who get here and have no regard to the laws here – why can’t people come in on merit, character and willingness to contribute to society – makes me so sad.